"Kelly, our caseworker Susan just called me; the children are going back to live with their mother tomorrow." After leaving the message on my wife's answering machine, I sat back in my chair, disheartened from the conversation I had with the children's caseworker. She had called me at work, informing me that the three children were to move back home with their mother. It was a difficult conversation, one in which I no doubt came across as the bad guy, so to speak. Their mother had gotten a job at a local fast food restaurant, and in the eyes of the state's child welfare system, was now able to appropriately take care of her children. Despite this, I was upset, and protested to the caseworker. "Susan, when I take foster children into my home, they become my children. I fight for them as if they were my own." I had told her just moments before on the phone. "I wonder if this young mother will be able to provide for them all that they need. How can someone who is so young, and by herself, make sure that Micah, who has severe learning disabilities, and Joshua, who has anger issues, get the resources they need to thrive? Kelly and I have struggled enough by ourselves to provide what these children require. How can she do this, by herself? Besides this, it was just a few months ago that she was beating them with an electrical cord. Are you telling me that because she has a job now, she no longer has these issues?" I was frustrated, and I was concerned. I just didn't want to see these children placed back in an environment where they would take steps backwards, where they would suffer. My phone call did nothing to change the situation, though I did feel better knowing that I at least tried. After all, every child needs someone to fight for them. Yet, at the same time, I knew that I was being judgmental, that I was judging this lady, whom I had never met. It was terribly unfair and wrong of me, I recognized, and I was ashamed of it. I just had such a difficult time believing that this decision was the best one for these children. In fact, Kelly and I both believed that the children would eventually be returned back into foster care, as so many children often are. With this in mind, I made the request to Susan that we have the opportunity to have them placed in our home again, if only for the sake of consistency for the children. Two days later, I dropped the children off at their daycare, along with their clothes and belongings. Susan was to pick them up later in the day and return them to their home in what is known in foster care as "Reunification," or the reuniting of a foster child with a biological parent or family member. Like all the rest, this was a difficult time for our family, as we had become quite attached to them, despite the exhaustion we felt. In fact, this was a particular difficult separation for Kelly. Kelly had grown to love each child individually, though she had developed a special love for baby Linda. This tiny infant, so very precious and so very helpless, had wrapped herself around Kelly's heart. Perhaps it was Kelly's mothering instinct, perhaps it was the hours and hours of treatment each evening and morning, perhaps it was simply that Kelly, like many mothers, loved babies. Yet, when it was time for Kelly to give the baby one last kiss, she did so, with tears streaming down her face. Four words; four simple words that Kelly had heard her own children say to her countless times throughout each day. Four words Kelly had heard many other foster children tell her, as well, throughout the past eight years. Yet, from Micah, these very words shook Kelly so emotionally that she could only hug the boy all the harder, drawing him into her chest tightly as she embraced him deeply. Micah, who had only been able to speak no more than two words at a time, spoke volumes to Kelly that moment. The little three year old boy, who had never spoken the words "love" or "Mommy" before, had reassured to Kelly that, despite the difficulties, being a foster parent to these children was not only worth it, but that she had made a positive impact in their lives. As one who is considering becoming a foster parent, you might struggle when your children from foster care move from your home. There are times when the removal of a foster child from may come suddenly, and without any prior warning. You may only have a few days, or even a few hours, before your foster child is to move. This may be due to a court order, health reasons, or placement into another foster home. Other times, plenty of notice is given to the foster parents beforehand. Whenever you are told, there will sure to be emotions involved, for both you and the foster child. Keep this in mind, though. When you become a foster parent, you make a difference. You will make a tremendous difference in the life of a child in need. Though you may not be able to recognize it, you will change the life of a child, and have done so for the better. As I write in my latest book Faith and Foster Care, years later, after a foster child has left your home, he may not remember your face. He may not remember your name. Yet, that child will remember one this; that he was important, and that he was loved. Thank you for loving children in foster care. Thank you for changing the world, one child at a time. Dr. John DeGarmo has been a foster parent for 13 years, now, and he and his wife have had over 45 children come through their home. He is a speaker and trainer on many topics about the foster care system, and travels around the nation delivering passionate, dynamic, energetic, and informative presentations. 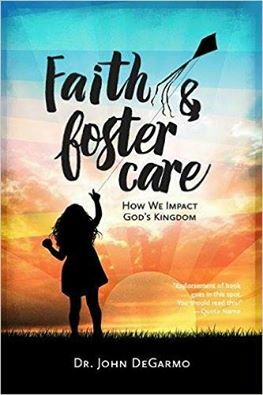 Dr. DeGarmo is the author of several foster care books, including the brand new book Faith and Foster Care: How We Impact God's Kingdom, and writes for several publications, including Fostering Families Today magazine. Dr. DeGarmo is the host of the weekly radio program Parent Factors with Dr. John, He can be contacted at drjohndegarmo@gmail, through his Facebook page, Dr. John DeGarmo, or at his website.